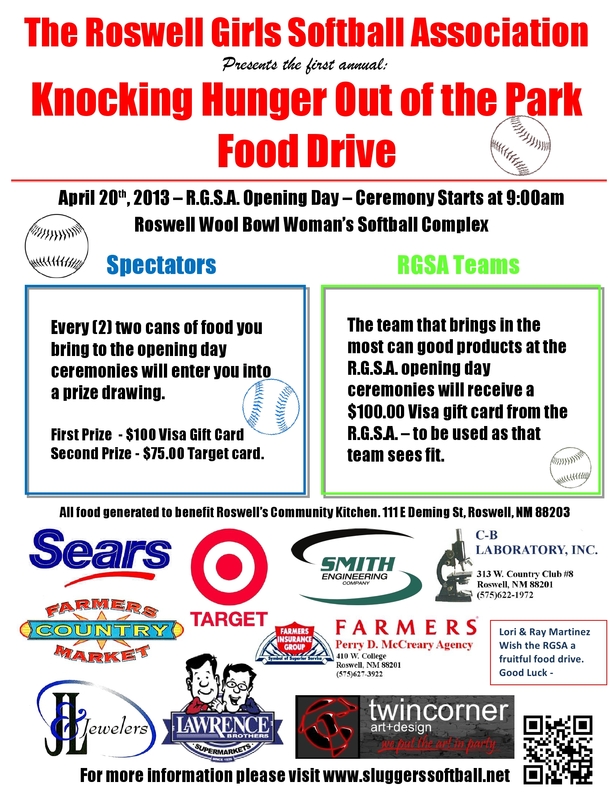 April 20th, 2013 will be the re-opening of the Roswell Wool Bowl Softball Complex which has been under construction for the past few months. The addition of three brand new softball fields, new concession stand, field lighting and score keeper’s booth is a huge upgrade for our facility and has increased our player registration numbers this season. With such a wonderful facility being provided by the City of Roswell for our girls, it seemed like a good idea to try and give a little back to the community, so we came up with a way to do just that. If you don’t like your chances of winning the drawing with only one entry, play the odds and bring more food. If you want your name in the drawing ten times bring twenty cans of food. It’s that simple. Just remember we won’t accept cans that are open, damaged or have the labels removed. For a full description visit our RGSA Food Drive page. This entry was posted in food, food drive, RGSA and tagged City of Roswell, food drive, girls, knocking hunger out of the park, money, raffle, RGSA, Roswell Wool Bowl Softball Complex, softball, Sports, target card, visa card. Bookmark the permalink.